Isotrex (Izotretynoina) prescriptions are currently not available via our online consultation service. You can, however, request an online consultation for acne treatment. How do you use Isotrex? Attention please: Isotrex has been discontinued by the manufacturer. Please follow this link to find other medicines in the category acne. 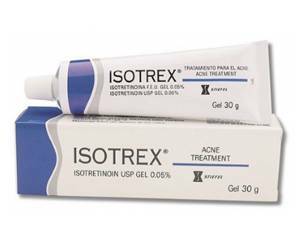 Isotrex contains the active ingredient isotretinoin and helps for severe form of acne and rosacea (acne rosacea). The gel ensures that the acne symptoms disappeared within a few weeks. It reduces excessive sebum production, and ensures that the sebaceous glands don't grow. Cell division of the upper layer of skin is stimulated, allowing that old cells quickly disappear. In addition, Isotrex ensures that new pimples or blackheads formation will not arise and inhibits the inflammatory response, which reduces redness. Isotrex (isotretinoin) is a good alternative to the medicine Roaccutane. The gel has the same effectiveness and helps well to treat acne. Use Isotrex as directed by your doctor. You bring the gel to the skin where acne occurs. In general, lubricate 1 to 2 times a day. Was your hands after use. After 6-8 weeks you already notice results and acne is clearly reduced. Using Isotrex give possibly side effects. You may get dry lips, eyes or nose. Other possible side effects include muscle or joint pain and when using a high dose, it is possible that you may experience temporary hair loss. This is rare. When stopping treatment, the hair will grow back. You can read the complete list of side effects in the Isotrex leaflet. Be aware: Don't use Isotrex during pregnancy or when breast feeding. Also, children younger than 12 years are not recommended to use the medicine.